TOPEKA, Kan. — Emporia High School Junior Varsity Team along with teammates John Highly & Hayden Baumwart, are the 2017 “KSHSAA Spirit of Sport Award” winner. This award recognizes the values inherent in high school sports beyond winning and losing. KSHSAA Executive Director, Gary Musselman, invited all member high schools of the Association to submit the name of an individual, coach, or team demonstrating such qualities. The JV baseball team was selected from other outstanding nominations submitted by KSHSAA member senior high schools. Three Kansas high schools submitted four nominations. Nominees include: Kalen Richardson, a student at Linn Public School; the Junior Varsity Baseball Team along with teammates John Highly & Hayden Baumwart from Emporia High School; and the Football Cheerleaders, from Erie High School. The Emporia JV baseball team was to play a routine game against the Waverly/Lebo baseball team last spring in Lebo. Two baseball players, along with the team, were instrumental in creating an inclusive environment which exemplified the ideals of which interscholastic activities are framed. The team was enjoying a successful game on a beautiful day. It was the bottom of the final inning and the home team was up to bat. A player who has an exceptionality came to the plate and John, the Emporia High School pitcher, decided to intentionally walk the player to allow him to reach the base. The next batter came to bat and the player on first stole second base. At this time the players, coaches, and fans of both teams were starting to cheer on the player running the bases, encourage him to steal home. The player stole home plate and scored a run for his team. This display of character and sportsmanship by the Emporia High School baseball team is the reason high school activities have such a vital role in the development of our youth and our communities. The students reacted with spontaneity and grace to provide a genuine opportunity for another player who normally would not have experienced that success. After the game, the parents of this particular player, thanked John and the team for being classy players who showed great character and sportsmanship which resulted in their son getting on base for the first time in his baseball career and scoring his very first run. All the players, coaches, and spectators will not remember the score of the game on that spring day, but rather the relationships these players built and how doing the right thing through life will leave a lasting impact. As the state honoree, the Emporia High School JV Team will receive a plaque to be displayed at their school. The presentation of the plaque will take place at a KSHSAA tournament or local event that is yet to be determined. 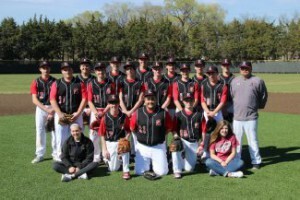 Emporia High School’s winning nomination of their junior varsity baseball team has been submitted for consideration by the National Federation of State High School Associations. The National Federation initiated the “NFHS Spirit of Sport Award” in 2008. The NFHS will announce a national honoree at its annual summer meeting in early July.